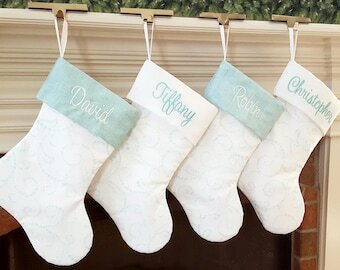 Personalized Christmas Stockings, Tree Skirts and more! 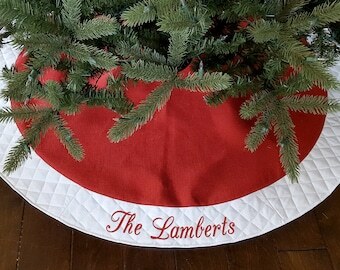 Announcement Pretties Please offers high quality personalized Christmas stockings and tree skirts for the whole family! They make great wedding gifts too. If you would like to see all your names in all the fonts please message me your names! 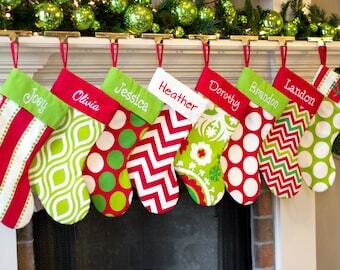 Pretties Please offers high quality personalized Christmas stockings and tree skirts for the whole family! They make great wedding gifts too. If you would like to see all your names in all the fonts please message me your names! 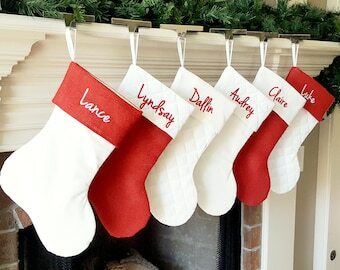 Christmas Stockings. Traditional Christmas Stocking. Red or Burgundy Velvet Christmas Stocking. Ivory Cream White Quilted top. Personalized. 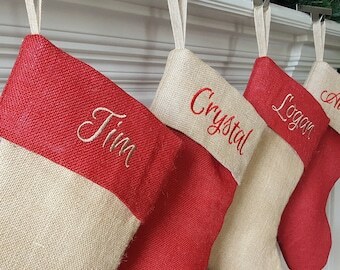 Personalized Christmas Stocking. Quilted Christmas Stocking. 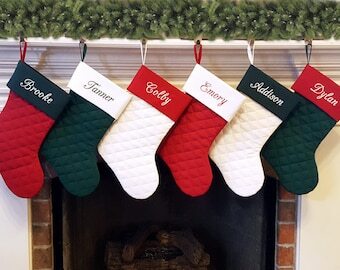 Red, Green, White Quilted Christmas stockings. 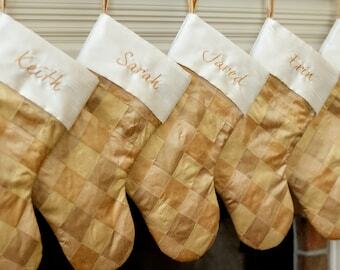 7 Styles of Christmas Stockings. 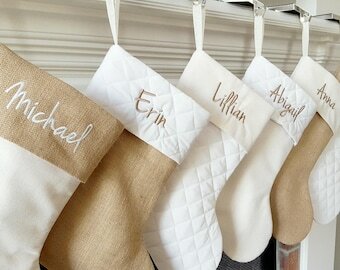 Personalized Christmas Stocking. 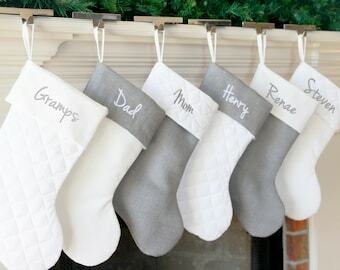 White Christmas Stocking. 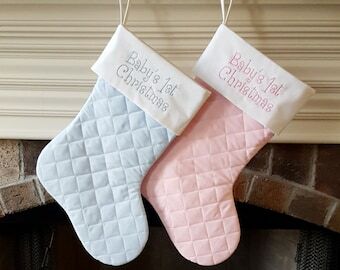 White Quilted Christmas Stocking. 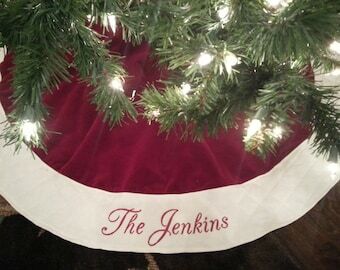 Personalized Christmas Tree Skirt. 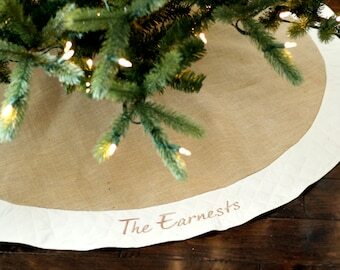 54" White/Ivory Burlap Christmas Tree Skirt w/ White Quilted Trim. 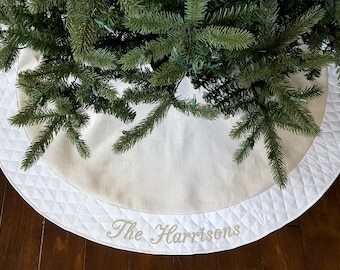 Personalized, Embroidered Tree Skirt. Beautiful stocking! Arrived exactly as pictured! Thank you so much! Beautiful! Very well made! Great selection of fonts to choose from. 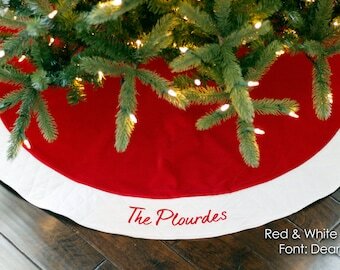 Green (or any color) thread option is available with the red and burgundy velvet Christmas stockings. If you want green just specify in the comments when ordering! Pretties Please specializes in Christmas Stockings, tree skirts, children's outfits, digital designs, and accessories. Quality is my number one priority along with customer service. Can you make the stocking boot face left or right? Yes! All stockings will face with the toe pointing to the right unless you specify in the notes section at checkout. Just request that you want the toe to face to the left. Can I do a different color thread than what is listed? Absolutely! Let me know in the notes at checkout what color you would like. What size are your stockings? My standard sized stockings are approx. 8.5" wide opening at top. 19" hanging length (not including hanging tab. 22" with hanger). 11.5" Heal to toe. XL stockings are approx. 11" wide opening at top. 28" hanging length. 14" Heal to toe. 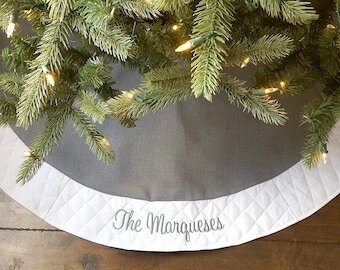 What size are your tree skirts? The default size for tree skirts is approx. 54" in diameter. Please contact me if you would like a smaller or larger size.